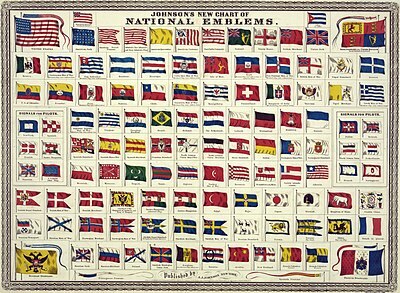 Johnson's new chart of national emblems, published c. 1868. The lairge banners shawn in the corners are the 37-starn banner o the Unitit States (flewn 1867–1877), the Ryal Staundart o the Unitit Kinrick, the Roushie Imperial Staundart, an the French tricolore wi inset Imperial Eagle. Various ither banners flewn bi ships are shawn. The Banner o Cuba is labelled "Cuban (so called)". The Cheenese draigon on the Banner o Cheenae wis drawn mistakenly as a wastren draigon. A naitional banner is a banner that seembolizes a kintra. The banner is flewn bi the govrenment, but uisually can an aa be flewn bi ceetizens o the kintra.